Who wouldn't want a cephalopod for a pet? Apparently Edgar. Jarvis the octopus does every thing he can to please Edgar while still uniquely being himself, but all Edgar can see is what Jarvis is not: a puppy. It's not until Jarvis flushes himself back to the ocean that Edgar realizes what he's lost and what he has to do to bring Jarvis home. Gorgeous illustrations! Can the OCTOPUPPY be the perfect pet? Edgar wanted a dog. Instead, he got an octopus named Jarvis. Jarvis is brilliant and does his best to act like the dog Edgar wants, but nothing he does is good enough to please Edgar. Ultimately, Edgar recognizes that while Jarvis might not be the dog he wanted, he is special in his own endearing way. Young readers will love the funny, imaginative illustrations that are paired with a relatable lesson of appreciating the greatness of what we have in front of us. Martin McKenna is a freelance illustrator based in the U.K. 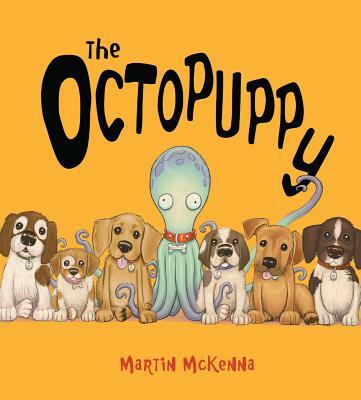 This is his first picture book in the U.S. For more information, go to www.theoctopuppy.com.